The funerary monument of Gregory XIV (Niccolo Sfondrati, born in Somma Lombardo, Varese,in 1535, and pope from 1590 to 1591) is one of the less elaborate in the Basilica and consists of a niche set into the wall with a simple sarcophagus below, bearing the dedicatory inscription. 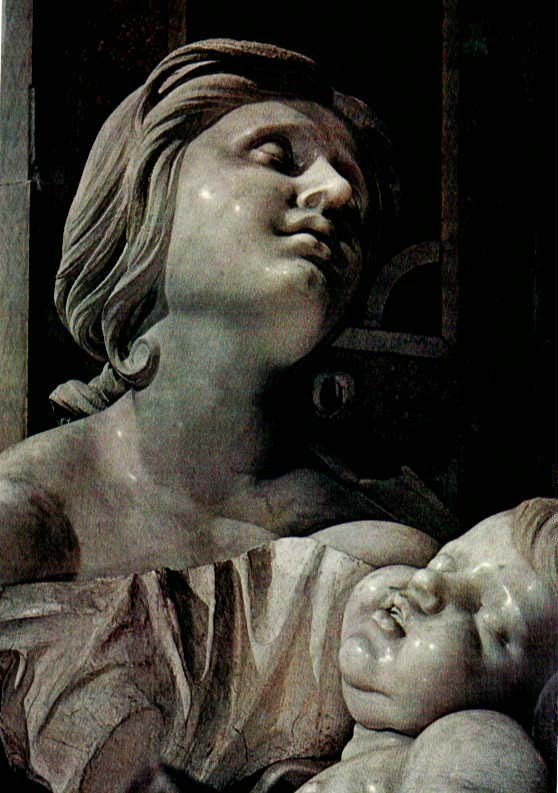 Giacomo della Porta was responsible for the design, while the sculpture is by Prospero Bresciano. The pope's arms, supported by angels reclining in the spandrels, crown the arch; two other coats of arms and two female personifications are painted in grisaille in the intrados. 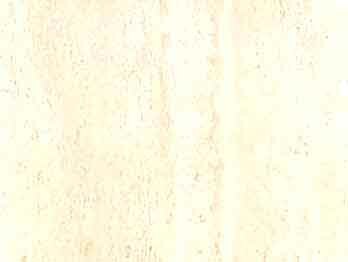 At the sides of the niche are statues of Religion (left) and Justice (right), and four rectangular panels, three of which are decorated with monochrome frescoes. 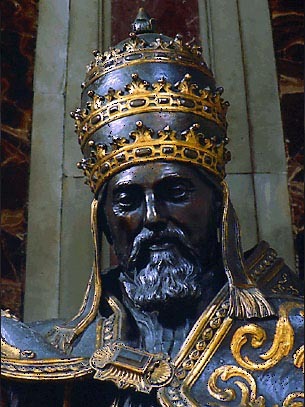 Gregory XIII was Pope for less than a year, in 1590 and 1591. 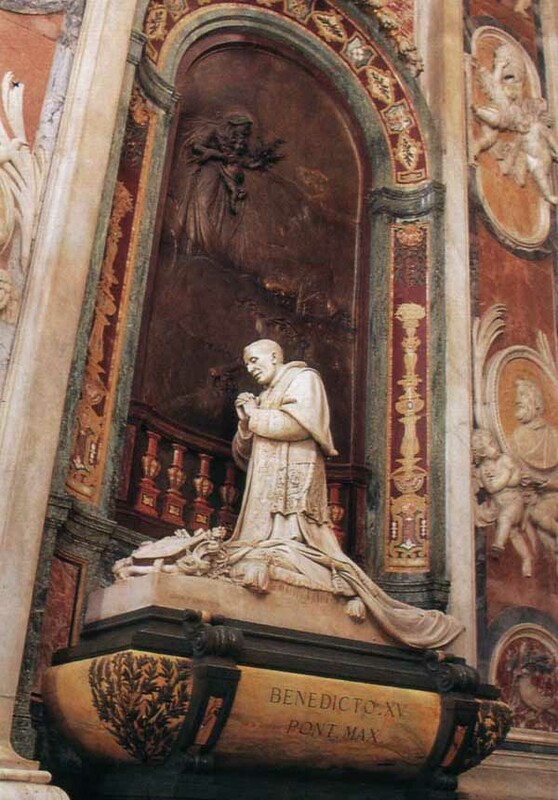 He received no statue, and is an unpopular Pope, for naming an inept family member as Secretary of State who squandered the Papal treasury during a local famine. Note unusual "XIIII" instead of "XIV." 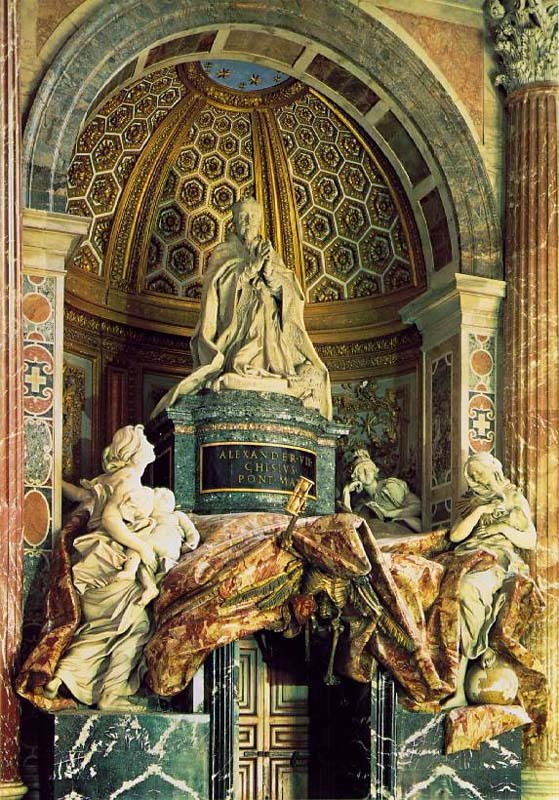 It is said to be a "recycled" tombstone that had been rejected a year before for Gregory XIII's monument! 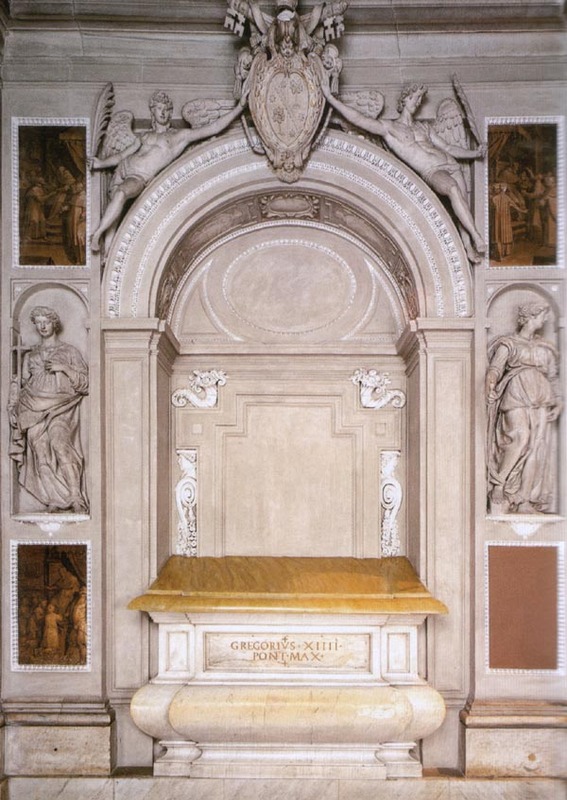 ... the humble tomb of Gregory XIV. Built by Prospero da Brescia with the two lateral statuettes of Faith and Knowledge, it was originally meant for Pope Gregory XIII. 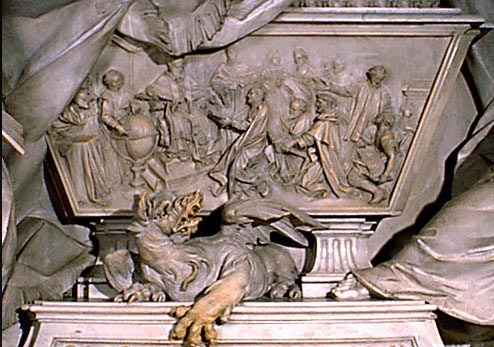 However, after the transfer of his remains to the above monument, the tomb was adapted with a stucco urn for Pope Gregory XIV Sfondrati, who reigned for only 10 months, from 1590 to 1591. The pontificate of Gregory XIV was one of the least popular and least successful in history, marred as it was by the appointment of his incompetent nephew as cardinal secretary of state and by plague, food shortages and lawlessness in Rome. Although only fifty-five years of age, he was physically weak and often in pain. The state of his health and his own insecurity about his lack of experience in the Curia led him to name his own twenty-nine-year-old nephew, Paolo Emilio Sfondrati, cardinal-secretary of state. Paolo, however, was more interested in his own and his family's well-being than in that of the Church. Resentment developed quickly among the other cardinals. He also banned all gambling on papal elections, the length of a pontificate, or the creation of cardinals. A great number of votes were united on Cardinal Gabriel Paleotto, but he had not a sufficient number; two new cardinals arriving, thirty-six votes were requisite. At length, on the 5th of December, 1590, at about noon, the fifty-six electors elected, with open votes, Cardinal Sfondrati, then aged fifty-five years. He thus on the instant found himself honored with a charge which he had not expected or desired. At the moment he was so astonished that, turning to the cardinals, who saluted him as Holy Father, he said: "God forgive you! What have you done?" However, he burst into tears, and refused to walk, and his voice was choked with sobs. 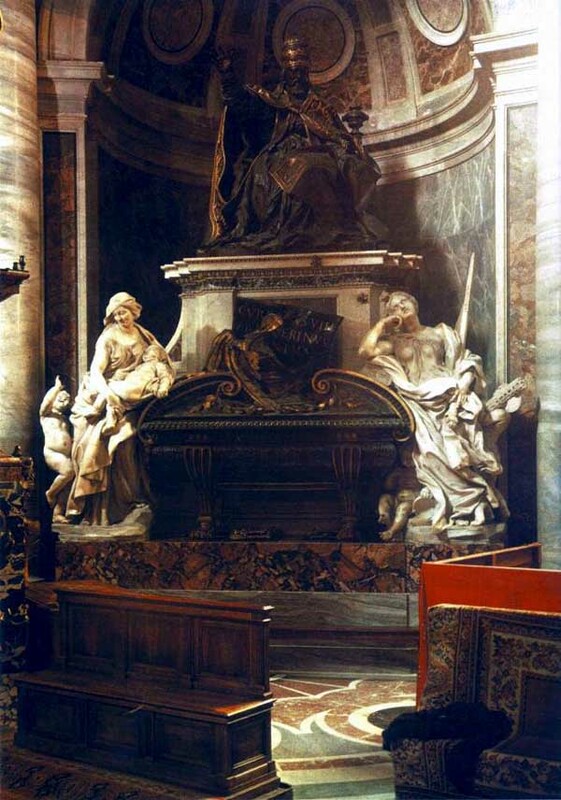 The sedia gestatoria was brought in, and he was carried in spite of himself into the Basilica of the Vatican, amidst the acclamations of the populace who wished him a long reign. Campana relates that, to relieve the sufferings of the patient, even pulverized precious stones and gold were administered to him. Muratori, on that subject, remarks: "This good pope, then, was surrounded either by stupid physicians or culpable ministers." 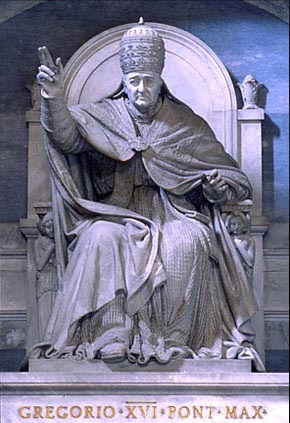 The pope soon sank under the violence of his sufferings, and died on the 15th of October, 1591, at the age of fifty-six. He had governed ten months and ten days. 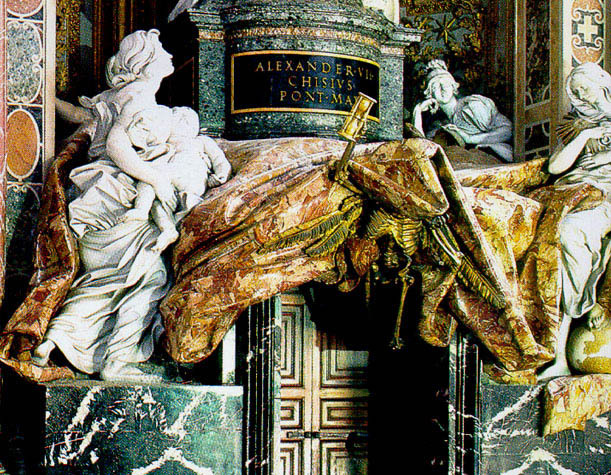 He was interred in the Vatican, towards the middle of the Gregorian Chapel, near Gregory XIII, in a tomb almost destitute of ornament. The biographers mention as a curious personal trait of Gregory XIV a nervous tendency to laughter which occasionally became irresistible, and which manifested itself even at his coronation. He was succeeded by Innocent IX after he died due to a large gallstone - reportedly 70 grams.